Purchase an Annual Vive® Membership to access CORE, LUXE, and ELITE Vive® Member plans. Build your personal Vive® Member account by making a monthly or annual deposit to use towards your favorite treatments. Use Your Vive® Member Funds Anytime, to Look & Feel Fabulous All The Time. Enjoy Vive® Member Pricing and Vive® Member Benefits all year long. Purchase your Annual Vive® Membership at the Vive® Rejuvenation Clinic to access the Vive® Member Plans. Book a complimentary Vive® Membership consultation to learn more. Call 403-237-8428. Up to 20% off services and products including laser treatments, micro needling, PRP, facials, chemical peels, skincare, and makeup. Member pricing on injectables and CoolSculpting® treatments. Regular facials and peels to enhance your treatments. Introductory skincare program to promote a healthy skincare regimen. Monthly or annual deposit into your Vive® CORE Member Account. 10% Off services and products. Complimentary consultation, skin analysis, clinical photography, personalized plan and treatments, ongoing follow up, and medical support. OxyGeneo 3-in-1 Super Facial + Brilliance Peel to enhance your rejuvenation treatments. ZO Skin Health Skincare Program to promote a healthy skincare regimen. Call us at 403-237-8428 to book a Vive® CORE Member Consultation. *Applied to regular priced services and products; cannot be combined with any other promotion. Monthly or annual deposit into your Vive® LUXE Member Account. 15% Off services and products. Complimentary consultation, skin analysis, clinical photography, personalized plan and treatments, ongoing follow up and medical support. OxyGeneo 3-in-1 Super Facial + 2 Brilliance Peels to enhance your rejuvenation treatments. Call us at 403-237-8428 to book a Vive® LUXE Member Consultation. Monthly or annual deposit into your Vive® ELITE Member Account. 20% Off services and products. 2 OxyGeneo 3-in-1 Super Facials + Brilliance Peel to enhance your rejuvenation treatments. Vivier Anti-Aging Skincare Program to promote a healthy skincare regimen. Call us at 403-237-8428 to book a Vive® ELITE Member consultation. Vive® Rejuvenation Clinic is a boutique medical skin rejuvenation clinic in SW Calgary, nestled in the beautiful community of Discovery Ridge. We offer medical laser treatments, Botox®, Juvederm®, CoolSculpting®, dermatology related care, acne management, chronic migraine management, medical aesthetics, and medical grade skincare. The Vive® Team, comprised of highly skilled and experienced family physicians, health professionals and excellent support staff are fully committed to working with our clients to help them achieve their rejuvenation goals for skin, face, and body, and realize their full potential to “Look and Feel Fabulous”. 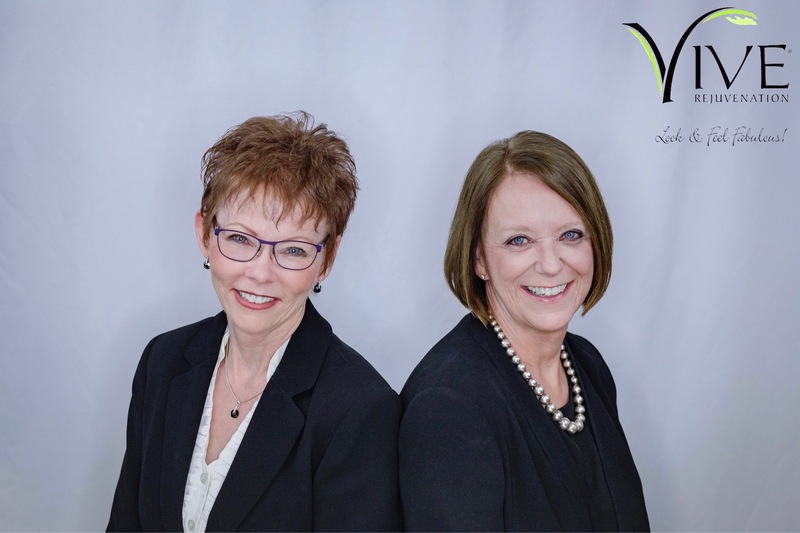 As a family physician owned clinic, Dr. Wendy Tink and Dr. Pat Connick ensure that we provide our clients with quality, innovation, safety, experience, and customized treatments to improve their skin health, their confidence, and their well being. Call us at 403-237-8428 to book your complimentary consultation, where you will receive clinical photography, a skin analysis, education on your options, and a comprehensive personalized treatment plan to meet your rejuvenation goals.